Here is a really cool video which is part of the BBC’s “Deadly 60”, which features 60 of the world’s deadliest animals. This particular segment highlights the Mantis Shrimp, and shows it’s incredible power and accuracy. This amazing animal, has had it’s strong claws earn the name “thumb splitters” by divers. You can see in this video, that even in slow motion, the mantis shrimp appears blurry. That is due to the fact that it attacks at the speed of a .22 calibre bullet. With this incredible attack speed, the Mantis first hits it’s prey with the force of the claw, which does a lot of damage. Next with the cavitatiion bubbles collapsing, which can stun or even kill the prey on their own. In addition to it’s ferocious attacks, the Mantis Shrimp Eyes, have inspired possible advancements in DVD technology. 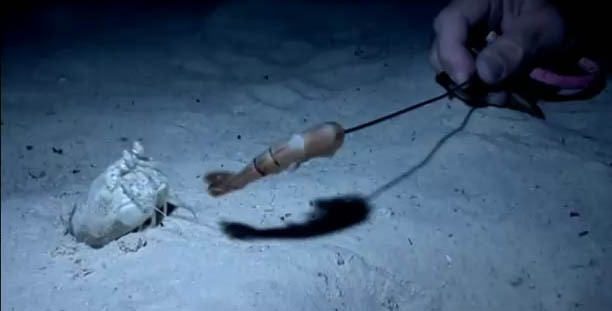 Here is a CRAZY VIDEO of someone hand-feeding a mantis shrimp. PLEASE DO NOT TRY THIS AT HOME!